The Lien Foundation has done it again. They're making us smile by doing unconventional projects that incorporate ideas about dying into the arts. Like their project "Happy Coffin" done as apart of the overall Life Before Death campaign, the Last Outfit project attempts to reduce the stigma that surrounds death and dying. This photographic project was instigated by the The Straits Times, a leading Singapore newspaper, who partnered with the philanthropic Lien Foundation. 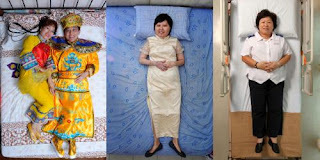 Eight professional photographers captured 23 subjects in their outfit of choice for burial. Most burial outfits are favorite clothing picked out by a patient just prior to death, or very often picked by family members. The idea traditionally is not about creativity, but respectful formal wear. The thought from the Last Outfit project was, what if this were changed? What if our final outfit was a statement about who we are? This personal flare is quite obvious in the photographs taken. 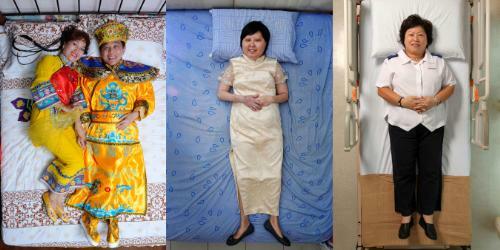 Lee Poh Wah, CEO of the Lien Foundation says, "Each exit outfit is one that best expresses the subjects' unique life. Their outfits and candid attitude have given us a fresh and fun perspective on how to deal with death. If there's something like funeral fashion,they are setting a trend by wearing their souls on their sleeves"
One of the subjects actually was on hospice for this project. Madam Foo Piao Lin had cancer and took her role more seriously. She chose an expensive cheongsam, which she had never owned, for her final outfit. She has since passed, byt her wish was fulfilled as she was buried in her cheongsam. She is pictured in the middle photograph in the series at the bottom. The photographs are definitely conversation starters. I wonder, though, if faced with death like Madam Foo, if indeed these same outfits would be chosen. What do you think? 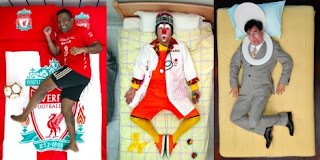 To those involved in hospice, how often is the last outfit actually brought up or discussed? Do you like the idea of creativity in a burial outfit or is it too much? To scroll through the 23 images and read short bio's of the participants visit The Last Outfit web page. The Singapore newspaper mentioned above is THE STRAITS TIMES (not the STRAIGHT Times) and is named after the Johore Straits that separates the island of Singapore from mainland Malaya. Thank you Rev Mike for pointing the error out!! I'll correct it immediately. The back ground information is quite informative!